For anyone (out of my 2 readers...) that's interested, the whole Muppet Suit thing came about when I got measured up for my custom suit and Davo (who thought he was being funny) put my name on the form as Little Muppet. I sent it off to Blue Seventy and hadn't corrected it since they knew who I was. A few weeks went by and I decided to check up on the progress and the people in the factory came back saying they had no record of a suit for Jo Carrel. So after a bit of panic and resending the measurements they said they had finished Muppet's suit and it was ready to go to send to Muppet. So once that got cleared up my suits will always be referred to as Muppet Suits and now they have even named it for me - perfect! 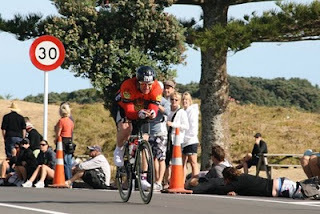 The last 2 weeks I have averaged around 12.5hrs and about 350km on the bike with some serious time in the hurt box. We had a few days at the Cook's Beach Training Camp so got to do a few rides around Coromandel as well as a solid 2hr effort at the Cambridge Training Camp. So after another week off running I have crept back into a little bit of running without any issues. I have got up to 60mins as 3x20mins with a couple of minutes of walking in between, yay! Fitness-wise I seem to be ok but think I will struggle with much over an hour, I guess we will find out in the weekend... 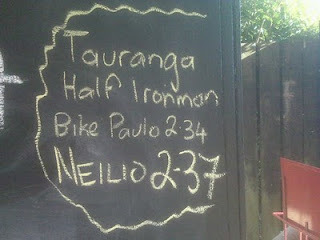 So I am heading into Tauranga Half Ironman with basically 2 weeks of running under my belt - not exactly ideal. But its either that or not run at all which is not really appealing. It is a 2 lap course so if I die from unfitness or start to get hip pain in the first lap I can always pull out. I think I just have to start out really, really slowly and rely on some running muscle memory. I will walk the aid stations so I get a bit of a rest every couple of km's and will just have to hope for the best. 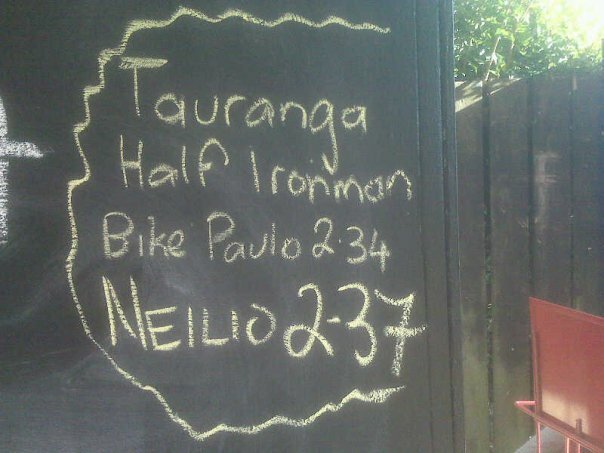 So this weekend is the Tauranga Half Ironman but without running properly its really going to be a half-arsed effort for me. There is quite a competitive women's field with heaps of Aussie girls coming over for it but I'm not too concerned about it, I just want to have a good swim (make up for last year...) and good bike and then try and not embarrass myself too much on the run. My dear friend Neilio is looking for a big hit out on the bike this year after blowing up spectacularly last year so all eyes will be on him. Good luck in Tauranga. Hopefully everything holds together on the run for you.